A Thousand Shades of Twilight: Songs of love and hate. And the not entirely hinged. 1. It is probably safe to assume that anything in my house is shabby and needs replacing (not helpful, I know). 2. A fine set of sharp kitchen knives. I feel like I have been grinding maize with a blunt rock for years. 3. A ticket to Leonard Cohen. Anyway, needless to say, I am extremely chuffed at the prospect of seeing Uncle Len tomorrow. I never thought he would visit little old Adelaide again in my life time, let alone his (I guess the dutiful visiting of far-flung outposts is part of the job description of an artist who has lost all of their money). I am chuffed and a little trepidatious. I am always nervous about seeing one's lifelong heroes after such a long wait. I am not demanding to be moved. I am not, after all that same easily movable youth that I was when I first embraced him. But I am hoping at least to be entertained. Oh, hang it all - I desperately wanted to be moved as well. It has been a while. I like the way that this song captures the wistfulness and inevitable disappointment of the life-long fan, but also the arrogance. The line 'I let it go by' suggest that we fans are sitting there like Roman Emporers with our thumbs poised. Of course 'our' artists move on. Of course they are a little hammy at times. Why insist that they be pickled in aspic? In fact I think I chose this film clip because the imagery provides a sort of smoke screen from the artist himself. After all, I feel almost shy about seeing him perform tomorrow. I also think that the juxtaposition of 'L'Eclisse' with 'Suzanne' makes a certain sense, with its atmosphereof stifling existential dread and 60s cool. And its requisite characters flitting about erratically. For some reason I really like the dogs running up the stairs. I must say, though, that there is a warmth about Suzanne as well (that sun does pour down like honey, after all) which could lead to a whole other visual interpretation. But this one suits my misguided romantic search for lost time. This week, I finally caved and bought an I-POD. I must admit to not fully understanding what an I-POD was until I had it in my hot little hand. Actually, I am still not quite sure what it is. A too-small silver cigarette case that somehow makes noise, or so it appears. I am the type of pseudo-Luddite who whinges about how the new technology does not have the charm of the old technology. The same pseudo-Luddite, that is, who, the moment that new technology somehow insinuates itself in his life, cries 'To Billy-o with charm!' and wholeheartedly embraces it in all of its treacherous glory. In this instance, I wanted to make a purchase that somehow, in some small way, improved my quality of life. I figured that if I have a means of making music portable, I will suddenly emerge as a vigorous gardener, an inveterate keeper of fitness or, perhaps, a person with a habitable house. So far, I must confess that it has been business as usual, although I did go and look at the weeds this afternoon. They just looked back. With great insolence. 1. Why are there so many sad songs? Is it premature to ditch all those songs of yearning, loneliness and regret? As much as I hope so, I am not yet ready to say sayonara to The Man I Love, Lover Man, Only the lonely, One for my baby, In the wee small hours, Ill wind to name but a few of the songs I am copying AS WE SPEAK!. Those songs got me through years of singleness and hangovers, and it would seem churlish to cast them aside now. Besides, as much as I hate to admit it, I am superstitious about getting rid of them. It is like tempting fate. Does being happy mean that I must have Sunshine, Lollipops and Roses on constant rotation? 2. What about the Janis Ian, Stairway to Heaven and Peter Paul and Mary Question? All of the above bring back their own pleasant memories, quite unrelated to the songs themselves. How do you do, would you like to be friends? were REALLY conducive to happiness and a healthy self-esteem? Or have they possibly outlived their usefulness? I certainly hope so. Stairway to Heaven, on the other hand, reminds me of long summer nights with the front door left open, lying around on the floor (do people still lie around on floors? Or was that just a hangover from the 60s and 70s, man?) with the Bored Big Kids and not feeling out of place. But let us face it: Stairway to Heaven is, well, Stairway to Heaven. It is one of the most ridiculous songs ever written. And I will never forgive two of my sisters for taking me to see The Song Remains the Same at the cinema (a double bill with The Jimi Hendrix Story!) when I was about ten years old. I actually thought that movie was never going to end. Let us just say that the song certainly did seem to remain the same. For what seemed, to my young and impatient mind, like weeks. And I simply included Peter, Paul and Mary because that was one of the first records I wore out as a child. There is a photo of a young me wearing fake patchwork pajamas and big yellow headphones brandishing the Greatest Hits (on the cover of which, oddly, they were dressed like a Bonnie and Two Clydes). Peter, Paul and Mary spoke to the Young Me, but what does Puff the Magic Dragon have to say to The Old Me? Hold on to your inner child for as long as you can? Umm...how shall I put this? That ship has well and truly sailed. I do think, however, that The Two Beardies and The Blonde might just make it on to the 'Pod. For me, listening to them now is a comforting experience, akin to swimming about in amniotic fluid. And, it would only seem right that, at last, I could grasp the opportunity to pointedly exclude the ever-creepy Day is Done, which to me always sounded like Folk-lite's version of a Hitler Youth Ralley. 3. Was I no more than a misguided pretentious music wanker all along? Before the shouts of 'heresy!' reach fever pitch, I must add that I see the merits of those albums. And I bear them no particular ill-will. I have only just realised tonight, however, that I have never, well, cleaved to them. Rather, I have taken them like medicine. Sorry, Bonafide Classic Albums - it's not you, it's me. So we will see what happens with this whole vexed 'Pod business. There is a long and fraught road ahead. So many decisions to make. So much pressure to make the perfect, the ultimate selection of sounds. I will, I think, give the last word on the subject to my dear friend, Mistress C who turned 37 this week. She said she would love to digitally replicate some of the old mix cassettes I used to make for her. I said I would give it my best. But, she said, I have grown attached to the way Mel Torme's 'I've got the world on a string' always skips in the middle of the track. I don't think I could live with hearing it any other way. Do you think you could manage that? Ah, Vinyl - only you could render that song a paean to the pleasures of imperfection. So, then. Stick that in your 'Pod. I want surprises. Just like spring rain. 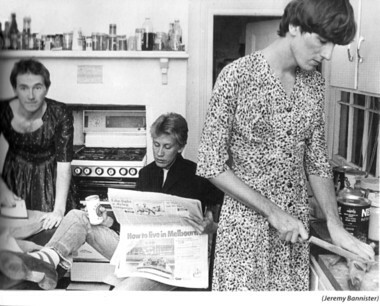 The Go-betweens had a massive impact on me as a teenager. Although I knew that they weren't gay, they did make me feel it was ok to be an Australian and a Sissy. And to hang out with the gals instead of the blokes. They had a female drummer which seemed so novel then (I discovered the Velvet Underground a few years later). They looked and sounded as if they'd never kicked a footy in their lives. Apart from Lindy Morrison, maybe. They all wore dresses at one time or another. Whenever I hear them, I imagine unsteady super 8 footage of suburban streets, disused railyards, dappled sunlight and girls in faded rose-print frocks, whose friend I'd have liked to be. This clip may have had something to do with that general impression, as it features some of those things. It also features the great Robert Forster prancing about like a ham with an umbrella, in some kind of slightly gauche homage to the European art films he so clearly loved. Spring Hill tumble-down, three story New Orleans-style boarding houses, diseased old palm trees, bats hanging off power lines, flapping there for weeks, rotting away, and always the smell of rotting pawpaws in someone's garden. Overgrown grass, old weatherboard houses that had never been painted, looked about a thousand years old - that's what we liked, that was our special Brisbane, and that was the Brisbane everyone else was embarrassed about; [they] wanted to get rid of [it] and put up a shiny new Brisbane we could show the world. Robert and Michelle, I think, realize they are in love with each other, and they run down the street, and it was a really nice tracking shot, a street in New Farm that was completely overrun with Moreton Bay Figs - the only light that got through was little pinpricks of dappled light. And they were just running. It made no sense but it was a beautiful, quite surreal image. 2. Robert Vickers looked like George Harrison in 1965. David Nichols quite sensibly points out that the latter was, of course, a comparison everyone involved in making the film would have adored. According to The Magical Internet, Heather's Gloves was shown as part of The Brisbane Sound Exhibition at the Institute of Modern Art in Brisbane earlier this year. As I live nowhere near Brisbane, I would love to hear from anyone who actually saw it. By the way, Robert Forster and Grant McLennan then embarked on a script for none other than James Garner. Yes, the James Garner of The Rockford Files fame. Oh, and McLennan's previous project was called Escape to Beaver Mountain. I kid ye not. 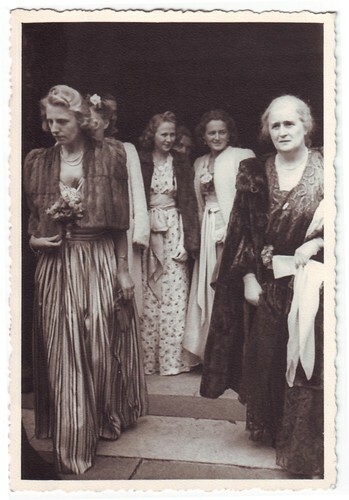 La regle du jeu (Rich Danish Ladies), originally uploaded by letslookupandsmile. For some reason, La Regle de jeu always brings to mind The Guests by Leonard Cohen (yes, Laughing Len is another favourite which this particular recovering melancholic needs to get out of his system early on so that he can move on to less predictable fare). The Guests can be found on the excellent 1979 Recent Songs and is included below. The song is accompanied by a found photo of Danish Society Ladies taken during World War Two. Renoir has suggested that Le regle de jeu was, in fact, a 'war film' that failed to mention the war. It has often been observed that the frivolous and rule-bound world of the high society characters in Renoir's film was about to collapse around their ears, which only adds to the film's poignancy. Clearly, the ladies above don't appear to have received the-end-of-the-world-as-we-know-it memo. "Let all my guests come in." or "Why has thou forsaken me?" My sister sent me an email today asking if I knew anything about Dory Previn. It was not such a strange question for her to ask me, as I fancy myself a bit of a connoisseur of flaky 60s singer songwriters (the type who warble about parallelograms and such). Anyway, here is my off-the-cuff response, and a picture of Dory P.
"Ha! Funny you should mention her - I picked up a second hand album of hers just last week! That album is called "One AM phone calls" - I can imagine her making a few of those. It has the Hollywood Sign song on it too. I really like her voice - her songs are lyrically and musically sophisticated (sometimes on the wrong side of kooky, but as you know I have a high tolerance for that). Needless to say, she comes across as needy, flaky but has quite a sardonic, self-effacing sense of humor as well. 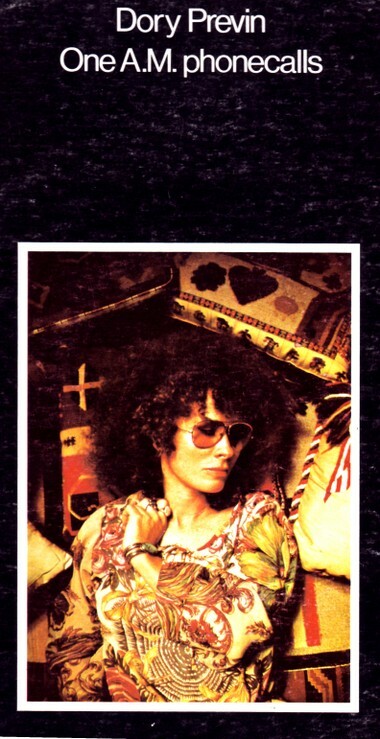 She first came to my attention through a Camera Obscura song called "Dory Previn" which has a chorus which goes "How I adore you Dory Previn, turned you up to eleven, for the Band's ears to bleed". I can imagine her music could be employed to annoy people that you didn't like. Andre Previn left her for Mia Farrow and consequently she wrote songs with titles like "Beware of young girls" and "Lemon Haired Ladies". There's a great photo of her in one of the old "After Dark" Magazines (a great magazine by the way, from the New York theatre scene in the 70s, very gay in a nudge nudge wink wink kind of way) in which she is reclining in a kaftan. She kind of looks like Jeff Lynne from ELO! Anyway, I've only listened to her album once, and think she was a class act. So that, in vomit-like fashion, is everything I know about Dory Previn! "The Altruist and the Needy Case"
"Mary C Brown and the Hollywood Sign"
"Dory Previn is her music. Like her songs, she is a bit austere and forbidding. Look at her portraits on the albums; look at those eyes peering out from behind the protective glasses, her mouth daring a smile or a laugh to break through. See her at a party and she seems too formidable to talk to. Her emotional problems are so widely known that you don't just go up to her and ask her how she is feeling for fear that she might tell you..."
"I can't fly but I can go on a mental odyssey and I will go to the deepest depths possible. I've had such terrors and fears and horrors of what I've discovered going into these depths, but I will not turn back. It may kill me and it may eventually drive me permanently insane, as it has often done for brief periods of time, but nevertheless, nothing will deter me from self-examination. I want to be in transition until I die."